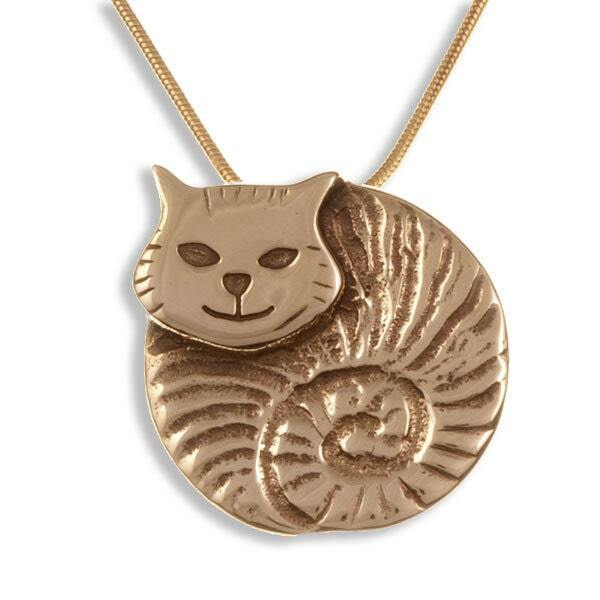 Embossed and polished bronze fat cat pendant on a gold-plated snake chain. More designs AVAILABLE under necklace & bronze section. The Bronze Age in Great Britain and Western Europe began over 4,000 years ago in around 2,000 BC. Both copper and tin were discovered, mined and fused together to form the alloy bronze, renowned for its strength and longevity. Bronze melts at a higher temperature than silver and also needs to be cast using the lost-wax process. Items can be made very fine due to their strength. We have re-created this ancient metal using recycled copper and Cornish tin to make a collection of bronze jewellery that is strong and very hard, but looks like gold. Bronze is traditionally given as an 8th wedding anniversary gift.